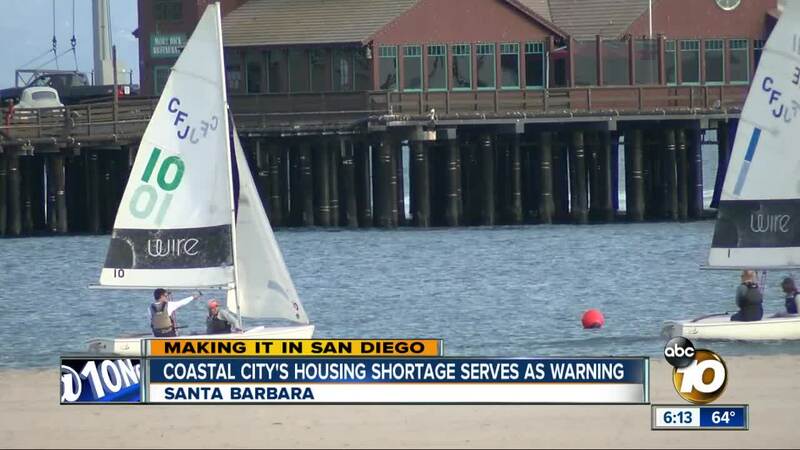 Santa Barbara's extreme housing crunch is serving as a dire warning for San Diego. (KGTV) - Andrea McGee has a chalkboard on the wall of her two-bedroom townhome in Santa Barbara. It reads, "Everything will be okay once you're okay with everything." "That was my mantra for this month," McGee said. In this case, she's okay with being a psychotherapist with a master's degree that must live paycheck to paycheck in Santa Barbara, a city of about 92,000 about 85 miles north of Los Angeles. McGee loves the city dearly, but it costs her. She and a roommate are splitting the $2,700 a month rent for the aging townhome, with a kitchen so small only one person can fit inside at a time. "Everybody talks about the new promise lands - the Denvers, the Portlands, and now it's even Boise, Idaho is the place to go," McGee said. "But I'm just trying to make it work in Paradise." With its big sandy beaches, an expansive boardwalk and a quaint shopping district downtown, Santa Barbara calls itself the American Riviera. But many of the people who work in the city can't afford it. An estimated 25,000 to 30,000 people commute to their jobs daily from affordable areas, some from more than 50 miles away. "We’ve had some employers leave town because of the high cost of housing," said Rob Fredericks, who runs the Santa Barbara Housing Authority. The relative hollowing out of the city's job market goes hand-in-hand with Santa Barbara's extreme housing crunch. At one point last year, Fredericks said the apartment vacancy rate was below 0.5 percent. The average rent for a two-bedroom apartment is now $2,500 a month. "Sure, we could solve the housing problem in Santa Barbara if up and down State Street we created 12 story developments, but that's not going to happen," Fredericks said. "That will not happen." San Diego, on the other hand, can build up. It's those tall, dense buildings that could keep the city from becoming the next Santa Barbara. The city of San Diego is now updating community plans to streamline thousands of new housing units, many near transit centers. But builders still need to step up, and cost and regulations are still issues. "Our region's needed new housing production is approximately at half of what is required to just keep up with population growth," said Borre Winckel, who heads the San Diego Building Industry Association. Winckel said the city of San Diego has shown a bipartisan approach to embrace higher densities, streamlining development applications, and deferring developer fees. But he says the industry still deals with the high cost of labor and community character concerns. Santa Barbara, on the other hand, has an incentive program with a goal of adding 250 new units near transit centers. But 5,500 people are already on its affordable housing waiting list. Ryan LaTorre works two jobs in Santa Barbara - as a server and clerk at a souvenir shop on Stearns Wharf - just to pay $1,200 a month to split a bedroom with his significant other. "Santa Barbara's a very small town," he said. "I feel like if you're not in school or you're not retired, there's kind of like no in-between in there. You're struggling the whole time."